An old friend in the computer gaming business called to pitch a new product. The product was interesting though not yet ready for prime time. But his call opened a window we hadn’t looked through in many years. We hardly ever mention computer games anymore, because it has become a specialty in its own right and is too narrow for this column. And yet, they’re still out there. More than half a million people tune in daily to Twitch.TV, where they can watch other people play video games. Ten million have downloaded the app to watch Twitch on their phones. Sound pretty stupid? We tuned in (because we have to) and it was actually interesting. In fact it was more interesting than a lot of the TV shows we’ve looked at for ten minutes or less. You can also tune in to watch artists draw the characters and scenery that go into these video games. This harks Bob back to the early days of personal computers, when the popular machines were Commodore and Atari, and the conventional wisdom from the far-seeing pundits was that personal computers would never amount to much and were only good for games. They didn’t understand what was happening, of course. Bob’s own managing editor told him it was just a fad. What strikes us about conventional wisdom was how conventional it is, and that the wisdom part usually drops off the edge of an intellectual cliff. Well things went along, and two students at Harvard designed a spreadsheet they called “Visicalc” that would run on Radio Shack’s TRS-80 personal computer. A guy in the dorm had one. But he transferred out and took his computer with him, so they were stuck with writing it for an Apple, another guy in the dorm had one. Radio Shack went bankrupt, Apple became a giant. Many things are subject to chance. Games lost their prominence but continued to live. They’re out there now; go to the web site Twitch.tv and watch. You think this would be a really boring thing to do? You think wrong. There are dozens, sometimes hundreds, of games going on. In the corner you’ll often see a picture of the player. You’ll hear their excitement, and feel it too. Get the monster, find the treasure, be a hero, or heroine. The program our old friend was pumping is a new arrival, still in “beta” testing, as they say. It’s called “MobCrush;” you can download the app or go to MobCrush.com. Gamers who play programs associated with movie studios, game companies and other commercial enterprises can earn anywhere from $15 to $2500 an hour, depending entirely on how many viewers they can pull in. The minimum payout starts with around 5,000 followers. So the kid who won’t go outside because he or she is playing video games could have earnings potential. A guy we know says his daughter, an artist, has over 10,000 followers. Well, that’s ten thousand potential customers. Dead artists can also pop back. 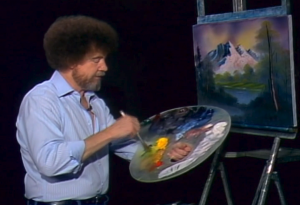 An old PBS show, “The Joy of Painting,” with Bob Roth, streams live, so to speak, on Twitch.TV. He died in 1995. Hundreds of thousands of viewers continue to watch the show. Other artists can be watched on Twitch by typing “creative” in the search box at the top of the screen. The Japanese “Manga” style is popular. We killed the battery in our old laptop by leaving it plugged in all the time, though after seven years it might have caught something deadly anyway. Battery death can happen to phones too, in just two to three years. The key is don’t over-charge. A free app for Android phones called “AccuBattery,” from AccuBattery.com, gives you an alarm when the phone you’re charging has reached the 80 percent level. According to the app maker, charging to the 80 percent level instead of 100 triples the battery life. Though modern phones are protected from overcharging when you plug them in all night, some experts say their batteries last longer if you turn your phone off after charging it completely. Another tip: Don’t let an Android or iPhone go completely dead. The battery will last longer if you charge them when they still have around 20 percent left. By the way, a new battery for our old Windows 7 laptop cost $27 on eBay. We gave the old computer away, and warned the person not to do as we did, leaving it plugged in. It should run on the battery alone a couple of times a month. When we’d had the laptop a few years, it no longer stayed charged for six hours but started sighing at two. In Chrome, go to chrome://extensions and click the trash can next to any you don’t want. Sometimes, however, the extension still has access to your account, even though you deleted it. Go to MyAccount.Google.com and click on “Sign in and Security,” then “Apps with Account Access,” to see which apps can access your account. In Firefox, click the hamburger icon (three stacked lines) in the upper right corner of the screen. Then choose “Add-ons.” Here you can disable any you don’t want or add new ones. “Cob house coziest place.” Search on that phrase to find a so-called “cob” home with a 25-foot high solar dome in Norway. The family grows almost all their food in an amazing greenhouse. WagnerStudios.org has some great Calvin and Hobbes’ snowmen comics. Joy sent the link to her nephew, who’s a big fan. More at GoComics.com.